Many of us have been conditioned to believe that investing is too difficult and time-consuming to attempt on our own. With so many products to choose from and so many risks involved, a financial "professional" is the only person qualified to handle the money you'll retire on some day, right? The truth is, no one cares more about your money than you do. And with a basic understanding of the investment process and the time-tested strategy offered here, you can successfully manage your own portfolio in less than 20 minutes a year. 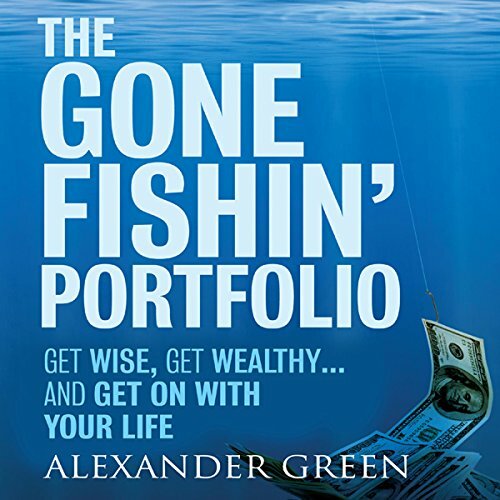 The Gone Fishin' Portfolio is based on an investment strategy that won a Nobel Prize in economics. Yet setting it up is a snap and maintaining it is even easier. You'll need less than 20 minutes a year. "Having known Alex Green for more than 20 years, I can tell you there are few investment advisors with more intelligence, knowledge, and integrity. His Gone Fishin' Portfolio is a superb strategy for delivering top-tier investment results. It's smart. It's conservative. It takes very little time. And the returns have been superb." (Michael Masterson, best-selling author, Automatic Wealth: The Six Steps to Financial Independence and Ready, Fire, Aim: Zero to $100 Million in No Time Flat). The first part of the book tells you why all of us should know that we know nothing. As an investor, if you haven't found that out yet it will save you a lot of money in the future. If you appreciate Mr. Green's advise, saving is the basis of all financial planning anyway. The second part of the book explains an easy way to manage your stock investment. Scintific literature suggests that you apply his rebalancing process to other asset classes - but the core of his adise is correct, hands on and easy to apply. In the third part of the book Mr. Green tells you - who, by now, knows that we all know nothing - why he knows more than anyone else and thus, why you should sign up to his newsletter. Advertisement is ok. However, it should reduce the price of the book and not be paid for by the reader. The most applicable investment book --pertaining to retirement/long term savings plan-- that I have ever read (and I have read quite a few). The book does a fantastic job of explaining the advantages of his portfolio, and he gives a step by step explanation of his positions (ticker symbol included) as well as his rationale for each position. I will likely utilize his portfolio for my retirement account because I agree that the portfolio will likely outperform the vast majority of financial advisers: at least net of fees. 3.) when one of your three sections are doing well, you pull money out and place the additional cash into the lower preforming sections to keep it balanced. do that and the author said you will become balanced and wealthy. I said all of that in less than 500 characters ... NOT 6 hours of audio! Excellent advice for the novice and experienced investor alike. Specific steps to take to invest for financial freedom.